Pictured: MD students chanting and walking in the Men’s March Against Violence. Vina Cristobal photo. 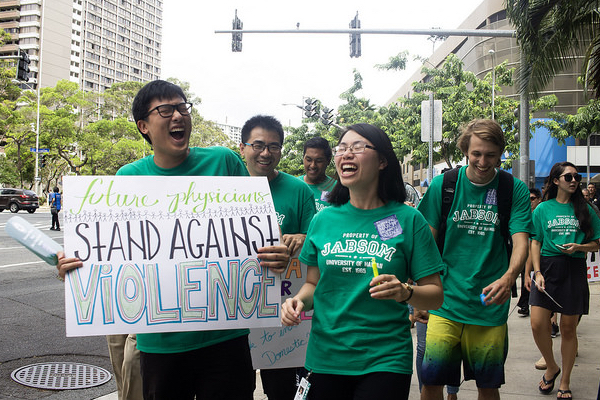 In a significant demonstration of commitment and leadership, Dean Hedges and a number of the men (and women) of the University of Hawaiʻi medical school participated in the 24th Annual Men’s March Against Violence in Honolulu. If patients are not ready to make the call, they can be provided with ready access to this number and pre-printed advice to which they can turn when ready. UHP will be stocking our clinics with items that can be provided to patients so that they can have these readily and unobtrusively at hand. For adults aged 60 and older with a disability, a provider who suspects abuse is required to report to Adult Protective Services (APS).3 If they are a member of a health care team, the provider is required to be assured that a designated team member is making the report. Dr. Blanchette writes a column “Wellness Watch” for the UHP newsletter. Read the newsletter.